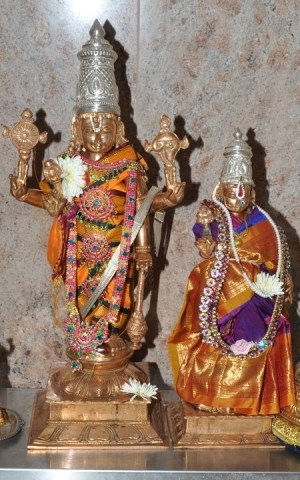 Šri Satyanãrãyana and His consort Šri Ramã Devi. Šri Satyanãrãyana is another form of Šri Vishnu, considered to be an extremely graceful, benevolent and powerful Deity. A resolve or promise to observe certain austerities as an offering of ourselves to Šri Satyanãrãyana is often taken up by His devotees. This is followed by a pooja ritual on full moon days.